Roasted Jalapenos, Sharp Cheddar Cheese mixed with a blend of Cayenne, Mexican Seasoning and finished with Flaked Sea Salt. Contact Coleen for Wholesale Unit Pricing! Coleen’s Better Than Breadsticks are packaged in 4 oz. bags; 12 bags per case; can mix cases. 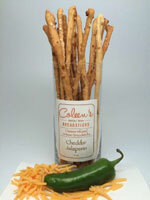 These breadsticks are ideal as a condiment at Tasting Rooms and Bars or can be sold as a retail product.